Although the timetable has been pushed back and protests continue to run, plans to relocate Tsukiji Fish Market continue. The cavernous fish emporium will be relocated to a new site on the outskirts of the metropolis from where it has stood for almost 80 years, possibly uprooting what has become tradition and a key part of Japan’s seafood culture. Over the years, the market has grown into a bustling town of its own, until authorities thought it best to move the market out of the city center to Tokyo Bay. The new market will be relocated to a modern facility about 40% larger with state-of-the-art refrigeration. The move was initially slated for 2015, will cost well over $3.8 billion, according to estimates. Hiroyasu Ito, chairman of the Seafood Wholesaler’s Association, insists the move, which is now expected to take place in 2016, is a crucial move for Tsukiji that will allow the market to better meet modern day demands. He added the outdated market is poorly equipped, lacking modern equipment for refrigeration and storage. “We have managed to keep the fish cold in high-quality foam coolers. 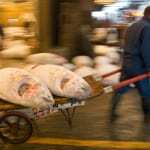 But we’re pushing the limit—Tsukiji is outdated,” he told AFP. Not everyone agrees with the idea of moving the market—with its traditional trading methods, the fast-paced coming and going that begins at the crack of dawn—away from the center of activity and the world’s eyes that will soon watch Tokyo as it hosts the Olympic Games. 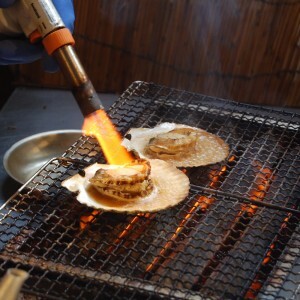 “The messy and crowded scenes at Tsujiki are what makes the place attractive,” said out-of-town visitor Tetsuya Kojima. Wholesalers have also protested the move, some claiming that developers are more interested in building more profitable real estate in the area. Plans for the move has been troubled by reports of heavy contamination at the new site, which was once formerly a gas plant. Developers are looking to build high-rise apartment buildings in the market’s location, a prime real estate located in the heart of Tokyo. In the meantime, it’s good to know that you can still take in the traditional spirit of the Tsukiji Market for at least a few more years.